A. 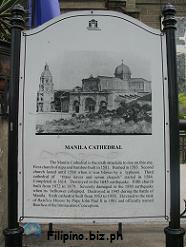 The Manila Cathedral is the sixth structure to rise on this site. 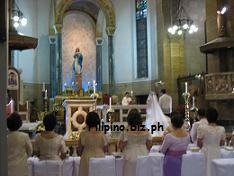 First church of nipa and bamboo built in 1581. Burned in 1583. 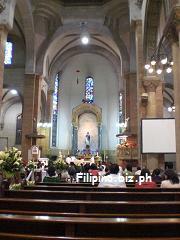 Second church lasted until 1588 when it was blown by a typhoon. Third cathedral of "three naves and seven chapels" started in 1584. Completed in 1614. Destroyed in the 1645 earthquake. Fifth church built from 1872 to 1879. Severely damaged in the 1880 earthquake when its belltower collapsed. Destoryed in 1945 during the battle of Manila. 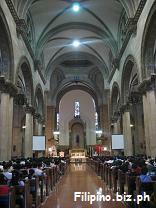 Sixth cathedral built from 1953 to 1958. 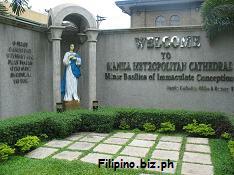 Elevated to the rank of Basilica Minore by Pope John Paul II in 1981 and officially named Basilica of the Immaculate Conception. B. First Cathedral built in 1581, damaged by a typhoon, 1582 and destroyed by fire, 1583. Second Cathedral built of stone in 1592 and partially destroyed by earthquake, 1600. Third Cathedral build in 1614 and destroyed by the earthquake of 1645. Fourth Cathedral magnificently build in 1654 - 1671 by Archbishop Miguel Poblete and destroyed by the earthquake of 3 June 1863. Fifth Cathedral built in 1870 - 1879 under Architects Luciano Oliver, Vicente Serrano Salaverria and Educardo Lopez Navarro and solemnly blessed in December 1879. 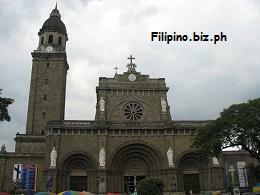 The center of the cross on the dome is a reference point of astronomical longitudes of the archipelago. 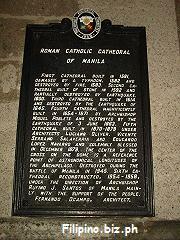 Destroyed during the Battle of Manila in 1945. 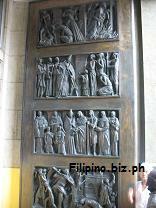 Sixth Cathedral reconstructed, 1954 0 1958, under the direction of Archbishop Rufino J. Santos of Manila, mainly with the support of the people. Fernando Ocampo, Architect.